Essays emerging from my varied interests in science, film, politics and philosophy, among other things. I've been working on a essay about Neill Blomkamp's "District 9" since late summer and it has morphed into a dissertation. What follows is a summary - my take on the movie as a first installment in a film saga that a re-imagines the "hero's journey" in new and interesting ways. Cutting-edge science fiction films are expected to be technically ambitious, to employ the latest in computer-generated imagery and bring to life alien creatures, other-worldly environments and marvels of engineering which previously existed only on the printed page or in a director's imagination. Neill Blomkamp's District 9 succeeds in this regard. And it does so in a way that reminds us that special effects are most - shall we say - effective when, like accomplished supporting actors, having been introduced with modest fanfare, they retreat from the limelight and allow the lead performers to get on with the show, all the while laboring diligently, but unobtrusively, in service of the production. What one doesn't expect is that a science fiction film introduce us to an intriguingly different kind of hero and launch him on a remarkably different kind of journey. District 9 does just this. We are accustomed to our cinema heroes being promoted from the ranks of rogues. 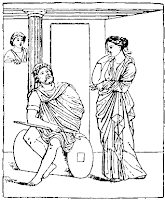 They may start off as hard-boiled detectives or egoistic renegades, for example, but they are soon revealed to be fundamentally decent, and even to posses the capacity for selfless courage. Such reluctant heroes are good - even noble - men, beaten down by life's tragedy or by lost love, who have cynically turned their backs on the world of good deeds. This is not at all the case with Wikus Van De Merwe (Sharlto Copely), the more-than-reluctant hero of District 9. We first meet him in a non-descript contemporary office setting where he is an undistinguished middle-level bureaucrat, a cog in a paramilitary corporation that goes by the name Multi-National United (MNU). (Think Blackwater Worldwide on steroids.) MNU has been contracted to manage the lives of the million or more extraterrestrial castaways, referred to disparagingly as prawns, who have been marooned in Johannesburg, South Africa since 1989. Twenty years on, the prawns live in a squalid squatter community, the District 9 of the movie's title, on the outskirts of the city. Disliked and unwelcome, they are about to be forcibly relocated to a new home miles away, which turns out will be little more than an out-of-sight concentration camp. Possessing none of the ambition that it would take to advance on his own, Wikus has been designated by his scheming father-in-law, a high-ranking MNU executive, to lead the prawn eviction. 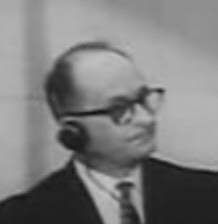 Although the epithet "little Eichmann" has been recklessly misapplied of late, it is hard to come up with a more fitting characterization for Wikus. Like Adolf Eichmann, the architect of Hitler's final solution, Wikus is not a bad man, at least according to any superficial reckoning. Friendly and self-effacing, he offers a ready, if somewhat nervous, bonhomie to co-workers and strangers alike. Hardly menacing, so desperate is he to avoid confrontation that he comes across as a dithering coward. And, to seal his "good man" bona fides, Wikus is a devoted husband to his beloved wife, Tania (Vanessa Haywood). So besotted is he with her, that the mere mention of her name sends him into a worshipful reverie. But Wikus is also professionally engaged in a monstrously brutal enterprise, one which asks him to commit morally reprehensible acts as a matter of daily routine. For example, he does not hesitate to threaten the well-being of a prawn child in order to elicit compliance from its father with a relocation order. Similarly, for nominally "hygienic" purposes, Wikus orders the torching of a nursery of prawn larvae, explaining to the camera crew documenting the eviction that this approach to the problem is far more efficient than the cumbersome procedure of destroying the developing infants one-at-a-time. What distinguishes Wikus, a veritable Eichmann manqué, from the maestro himself is that he is not the author of the oppression that he dispenses. Not much more than a rule-bound MNU functionary, he follows orders and does his job, all the while trying not to draw much attention to himself. In fact, Wikus is thrown off balance by the promotion that his father-in-law foists upon him. No company man, he would prefer, given the option, to be at home with his adored Tania, basking in the glow of their eternal puppy love. To put it bluntly, the problem with Wikus is not so much that he is evil, the problem is that he lacks a soul. The challenge for Blomkamp in District 9 is, therefore, to stir Wikus from his ethical torpor, to awaken him to the reality of the suffering of others, to afford him the opportunity for redemption for his sins, and to launch him on the essential hero's quest, and that is the quest for a deeper understanding of oneself and a more humane appreciation of a wider world. In this way District 9 announces itself as the first installment of a film saga in which Wikus, an unlikely Ulysses, is forced kicking and screaming into a miserable exile - ironically in plain sight - whence he begins his own odyssey, a desperate struggle to find his way back home and back into the arms of his beloved Tania. Blomkamp's creative re-imagining of the beginning of this epic story is both creative and exciting. I look forward to seeing how Wikus's voyage continues. District 9 - Yes, We Need Another Hero by Marc Merlin is licensed under a Creative Commons Attribution-Noncommercial-No Derivative Works 3.0 United States License. Based on a work at thoughtsarise.blogspot.com. As I told you in person, I really loved this movie; in fact, I saw it several times, and each time I noticed many new details. What made it all the more remarkable for a scifi film, was that it had a very well-constructed plot, with strong and believable characters, both human and alien alike -- scifi films and books are usually more about ideas, and skimp a little on the plot. Reinforcing this impression were the facial expressions of the alien Christopher Johnson and his son: I will never forget those doleful eyes of Christopher, and the look of a dreamer in the eyes of his son. And with just minimal ``eyebrows'', a world of emotion -- sorrow, concern, fear, and anger -- was conveyed by Christopher. It reminds me of an old George Carlin skit, where he asked why dogs have so successful a look; that is, why do we find dogs irresistible? His answer was that dogs have ridges over their eyes, that pass for eyebrows. It was especially interesting how the movie portrayed Wikus as `nice', `friendly' (and perhaps also `empathetic') at least to humans -- all the usual hallmarks of a ``good guy'' -- yet somewhat lacking in conscience. Perhaps one message to take from the film is that what makes one a decent human being is not all the exterior superficial manifestations of `goodness' (which, e.g., autistics have difficulty expressing), but rather the inner-voice or ``soul'', as you say, that gives rise to ``right intention'' and ``right action''. Thanks for your comments, Ernie. 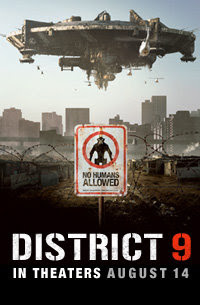 I saw "District 9" twice and look forward to seeing it again. The richness of this movie has been overlooked. As you pointed out, it stands apart in a number of ways from the usual science fiction fare, although it was typically reviewed only in those terms. I very much agree with your description of how effectively the animators imbued the prawn characters with emotion. As even simple emoticons demonstrate, the range of mental states that can be communicated through articulation of minimalist eyebrows and widening and narrowing and placement of simple eyes is quite remarkable. Because of prawn anatomy, mouths weren't of much help with modifying facial expression, which made their work that much more challenging. I think "District 9" breaks new ground in this regard. Prawn characters, like Christopher, remain unapologetically alien, but, at the same time, exhibit a kind of emotional range that makes them recognizably "human" - more so than many of the biological humans that populate the film. I also agree with your take on the moral lesson of the movie. Wikus is, in the literary sense, an "everyman" and his search for redemption becomes our own. He has to be "good" enough to merit our identification, but to be so flawed that his behavior is unsettling. There's a whole "Trading Places" riff that I have in mind for another treatment of this movie (titled, perhaps, "Prawn Like Me") having to do with how fish-out-of-water (or, in this case, prawn-out-of-water) devices are used in literature and film to initiate the moral awakening of an unformed hero. This is a great essay and it's been linked to at D9Dossier (d9dossier.wordpress.com). The Movie "2012" - Who Lost Tibet?